Turkish sultan; born 1447; succeeded in 1481; died 1512. During his reign the Jews enjoyed a period of complete and uninterrupted peace, which was reflected in the flourishing condition of Jewish culture and letters. Under Bajazet II. there were learned Sephardic Jews who occupied themselves not only with the Talmud, but also with the secular sciences. Among such scholars were Mordecai Comtino (1460-90), an astronomer and mathematician, whose Jewish and Karaite disciples included Elijah Bashyatzi, Caleb Afendopolo, and Joseph Ravizi; Solomon ben Elijah Sharbiṭ ha-Zahab of Salonica and Ephesus (1470-1500), preacher, poet, and grammarian; Shabbethai ben Malkiel Cohen, who had gone to Turkey from Greece; and Menahem Tamar, a liturgical poet (1446-1500). As early as 1483 there was a Jewish printing establishment in Constantinople. 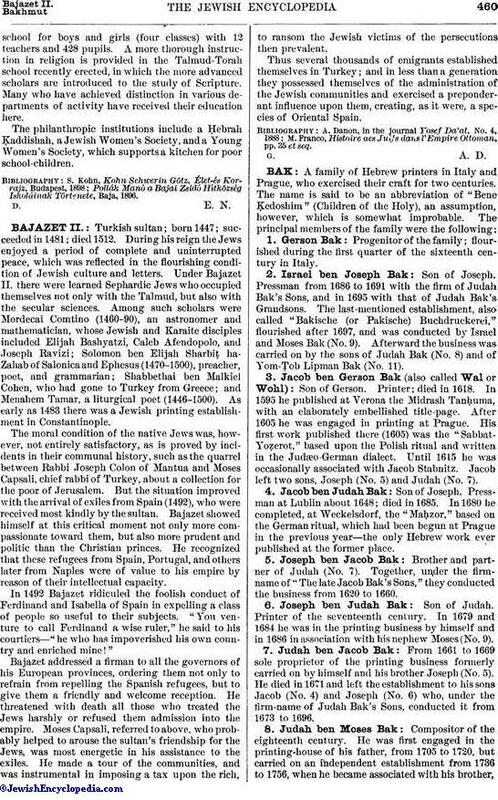 The moral condition of the native Jews was, however, not entirely satisfactory, as is proved by incidents in their communal history, such as the quarrel between Rabbi Joseph Colon of Mantua and Moses Capsali, chief rabbi of Turkey, about a collection for the poor of Jerusalem. But the situation improved with the arrival of exiles from Spain (1492), who were received most kindly by the sultan. Bajazet showed himself at this critical moment not only more compassionate toward them, but also more prudent and politic than the Christian princes. He recognized that these refugees from Spain, Portugal, and others later from Naples were of value to his empire by reason of their intellectual capacity. In 1492 Bajazet ridiculed the foolish conduct of Ferdinand and Isabella of Spain in expelling a class of people so useful to their subjects. "You venture to call Ferdinand a wise ruler," he said to his courtiers—"he who has impoverished his own country and enriched mine!" Bajazet addressed a firman to all the governors of his European provinces, ordering them not only to refrain from repelling the Spanish refugees, but to give them a friendly and welcome reception. He threatened with death all those who treated the Jews harshly or refused them admission into the empire. Moses Capsali, referred to above, who probably helped to arouse the sultan's friendship for the Jews, was most energetic in his assistance to the exiles. He made a tour of the communities, and was instrumental in imposing a tax upon the rich, to ransom the Jewish victims of the persecutions then prevalent. Thus several thousands of emigrants established themselves in Turkey; and in less than a generation they possessed themselves of the administration of the Jewish communities and exercised a preponderant influence upon them, creating, as it were, a species of Oriental Spain. M. Franco, Histoire aes Juifs dans l'Empire Ottoman, pp. 35 et seq.